Nepenthes robcantleyi x hamata is another manmade hybrid worth its weight in gold… almost literally. It’s a pricey collector’s plant, and for good reason. Most clones in circulation trace back to a fun N. hamata that grows in highland or ultra-highland conditions of Gunung Lumut, Sulawesi Indonesia. Take this already unique species and cross it with the infamous N. robcantleyi (N. x rabcantleyi?) and you’ve got yourself a gorgeous plant with characteristics of both parents vying for phenotypic dominance. I’m going to let the photos do most of the talking, here. 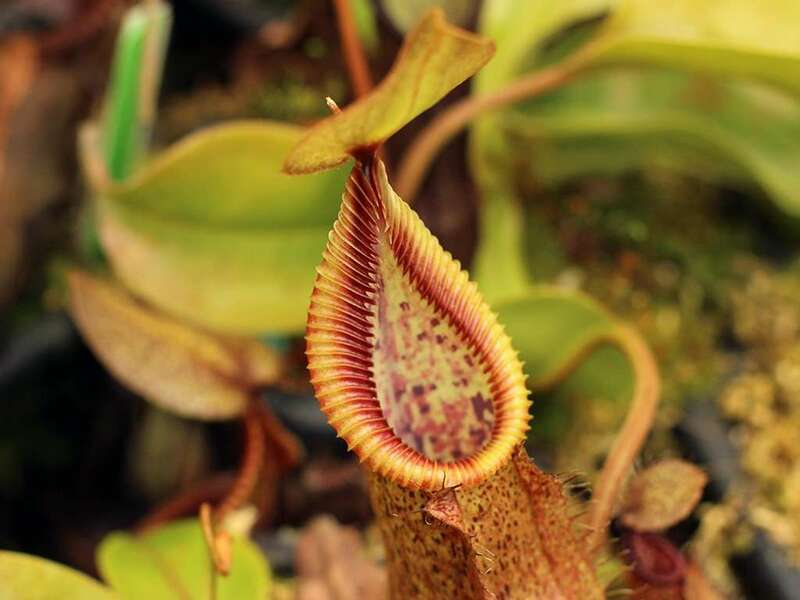 This hybrid tropical pitcher plant has prominent, but fuzed teeth along the peristome, melding the characteristic fishhooks of N. hamata and the flared peristome of N. robcantleyi. Mature pitchers are a lighter yellowish-orange tint, and heavily speckled in dark red and purple. Pitcher interiors are especially fantastic as light shines through the pitcher wall, highlighting the colorful speckles. Immature pitchers of Nepenthes robcantleyi x hamata tend to have darker speckling, and darker, almost purple, peristomes. As pitchers mature, the peristome lightens. 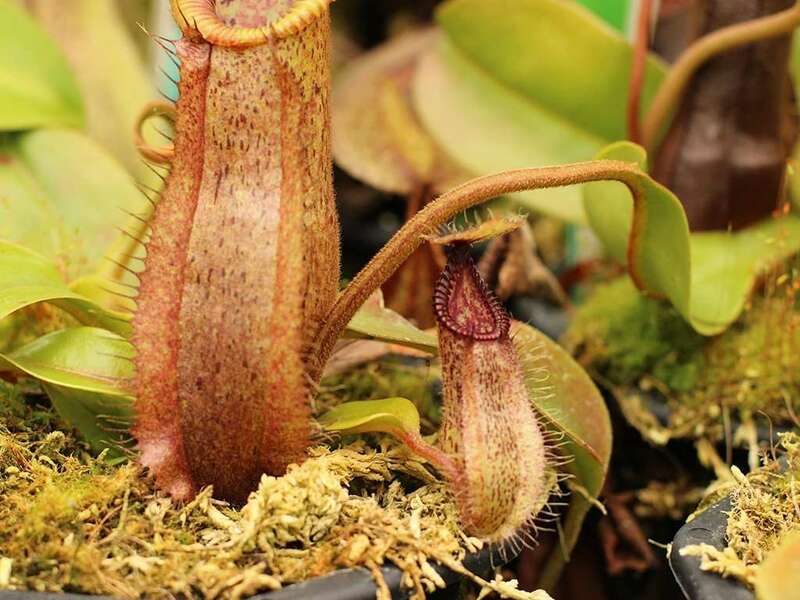 Oddly, the immature pitchers have a color more reminiscent of both N. robcantleyi and N. hamata. 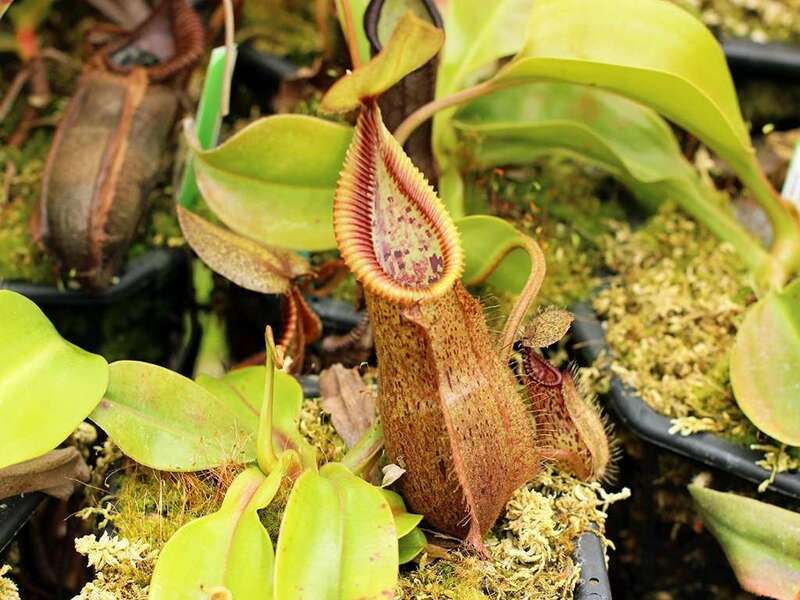 Of course, if you factor in the theory that N. robcantleyi is actually N. x robcantleyi – a naturally occurring hybrid between N. truncata and N. nebularum – you can imagine that this is a greener N. truncata peristome being expressed. Characteristically N. hamata lid hairs are visible on immature pitchers, and vanish with maturity. Wings on this hybrid are very pronounced.